I love tortilla wraps, always have done, but since being diagnosed coeliac and thus going completely gluten free I had to make the switch to gluten free wraps. 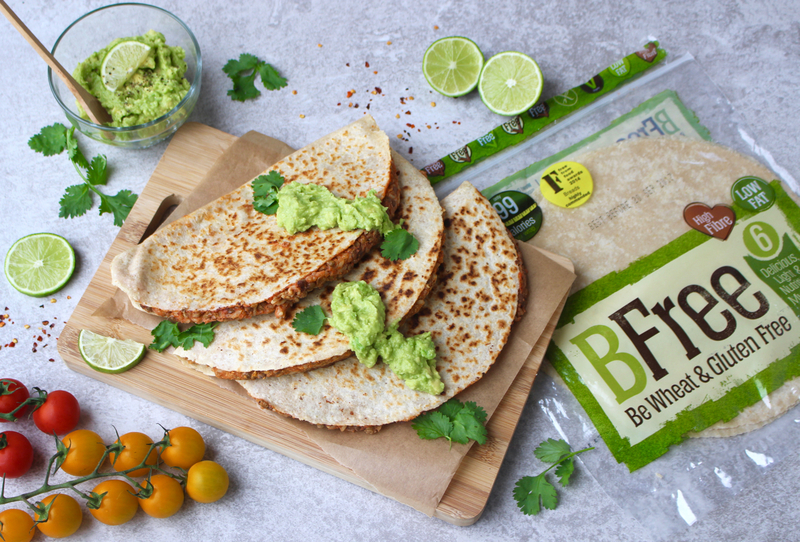 Thankfully, BFree Foods make the most amazing gluten free tortilla wraps (in 3 flavours too!) with the healthiest ingredients and a texture just like regular tortilla wraps. The thing I really love about these wraps is how light they are, as sometimes gluten free products can be a little heavy or almost stodgy...these wraps are far from that. 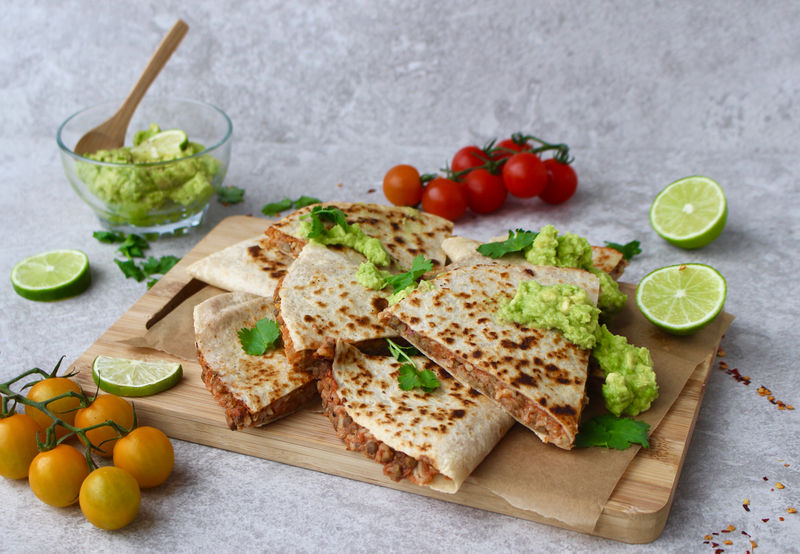 One of my favourite things to make with the tortilla wraps is fajitas, but this week I decided to get more creative and come up with a vegan quesadilla recipe using the multigrain wraps and they were a huge success! The BFree multigrain tortilla wraps go super crispy when cooked in a pan and the natural flavours in them seem to come out even more. Then there's the filling which is a delicious mixture of lentils and wholegrain rice in a homemade smokey tomato sauce, as well as nutritional yeast which is totally optional but adds a cheesy taste to the quesadillas - totally recommend if you can get your hands on it! These quesadillas are so quick and easy to make too! The sauce takes all of 5 minutes to throw together, the lentils you can buy pre-cooked, rice you could also buy pre-cooked and the assembly and cooking of the quesadillas takes no time at all. So you can have a hearty, delicious, filling, healthy, free-from meal for the whole family in less than 20 minutes! Winner. 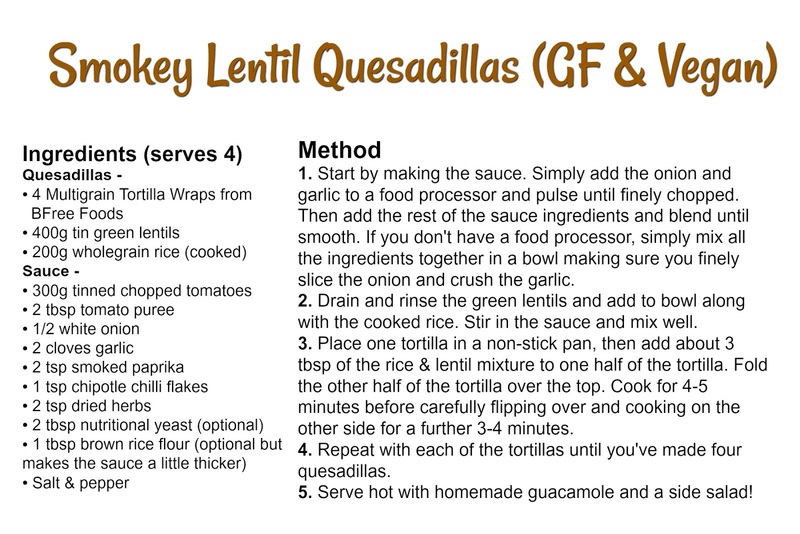 I'm going to try making these quesadillas with the BFree Sweet Potato wraps next....I imagine that'll be so tasty!